Tom Price of Monticello displays the nice 10-point buck which scored 77.5 in the Democrat measuring system to take first place in the Biggest Rack Division of the Democrat’s 37th annual Big Buck Contest. Price shot the buck, which weighed 144 lbs., on opening day, Saturday, Nov. 20, while hunting in the Town of Thompson. CALLICOON  December 17, 2010  More than 50 hunters entered deer in the Sullivan County Democrat’s 37th annual Big Buck Contest. And after tabulating the measurements and weights of those bucks, the winners of the contest are Tom Price of Monticello and Jerry Dagostino of Rock Hill. Price finished in first place in the contest’s Biggest Rack Division, while Dagostino took first place in the contest’s Heaviest Deer Division. The contest was open to hunters who legally took bucks during the regular firearm season here in Sullivan County or in Wayne County, Pa. and then registered their bucks at one of the official measuring or weigh-in stations. Ironically, both Price and Dagostino took their bucks on Saturday, Nov. 20, which was opening day of the season here in Sullivan County. On that day, Price shot a 10-point buck in the Town of Thompson. He took the buck to Cannie D’s in Neversink, which was one of the official measuring stations for the Big Buck Contest. The buck scored 77.5 in the Democrat measuring system. The Democrat system includes the length of the two main beams, the width from outside to outside of the beams and the number of points that are at least 1 inch long. Those four numbers are added together for a total score. On that same day, Dagostino shot a large buck and took it to Neves Taxidermy in Bethel, which was one of the official weigh-in stations for the Big Buck Contest. The buck tipped the scales at 175 lbs. For taking the top buck in the Biggest Rack Division, Price will receive a $100 cash prize and a free mounting of his buck courtesy of Rod’s Taxidermy in Callicoon. As the winner of the Heaviest Deer Division, Dagostino will receive a $100 cash prize. But Price and Dagostino are not the only winners in the contest. Bob Kackos of Neversink will receive $50 for being the runner-up in the Biggest Rack Division. He shot a 12-point buck on opening day and took it to Cannie D’s, where it scored 77.25 in the Democrat measuring system. Liberty resident Mike Chanov is the runner-up in the Heaviest Deer Division and will receive $50. On Nov. 20, Chanov shot an 8-point buck and took it to Cannie D’s, which was also one of the weigh-in stations for the contest. The buck weighed 170 lbs. Peter Jennings of Westport, Conn. will receive $25 for taking third place in the Heaviest Deer Division. 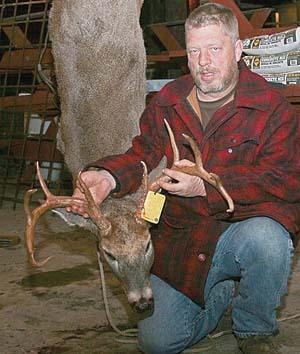 On Nov. 27, Jennings shot a 10-point buck near Long Eddy in the Town of Fremont. He then took the buck to The Sportsmen’s Den in Callicoon, which was one of the weigh-in stations for the contest. When it was placed on the scale, the buck weighed 166 lbs. It is interesting to note that of the 50-plus bucks which were entered in the contest, 13 of them scored at least a 70 in the Biggest Rack Division. In addition to Cannie D’s, Neves Taxidermy and The Sportsmen’s Den, other official measuring stations for the contest included Rod’s Taxidermy in Callicoon, TK Taxidermy in Jeffersonville, Tom’s Bait and Tackle in Narrowsburg and the Democrat office in Callicoon.